A big announcement today at the CSCMP conference came from Sterling Commerce, an AT&T company. The industry leader in supply chain information collaboration made another veritcal integration step by integrating real-time yard inventory management into the Sterling Commerce Transporation Management System. One of the first clients to utilize the new tool is CPG manufacturer Church and Dwight. Sterling Yard Management, an on-demand application that manages all the activities associated with a company's yard -- providing visibility into trailers from arrival through departure -- so companies have a total picture of their inventory. Sterling Yard Management is fully integrated with the Sterling Transportation Management System (TMS), providing a clear view of product movement from warehouse to delivery. "While managing the yard used to be an afterthought, the need for greater inventory visibility and improved management of yard assets has brought a renewed focus on the need for yard management applications," said Cory Wiegert, vice president, Applications Product Line, at Sterling Commerce. "By providing the industry's first fully integrated on-demand yard and transportation management solution, we are delivering the industry's most complete multi-channel order fulfillment solution. Companies can now manage orders through final delivery, allowing them to meet deadlines and streamline inefficiencies." Delivered as a Software as a Service-based (SaaS) application, Sterling Yard Management enables a broader range of companies to benefit from better yard management by offering a shorter implementation time and lower initial start-up costs compared to traditional on-premise applications. Its dynamic graphical view of the yard allows users to drill down into trailer details and contents while using a "click and drag" "move tasks" function between dock doors, weighbridges, washers and parking slots. It also offers highly flexible rules that allow automatic creation of move tasks, such as guided put-away and divert-to-dock tasks when an appointment is due. Integration between Sterling Yard Management and Sterling TMS allows companies to coordinate trailer and dock appointments, manage trailer inventory in conjunction with order fulfillment requirements and manage carrier detention charges. Working in concert across applications, the yard is now visible to the rest of the organization. Sterling Commerce customer Church & Dwight, which manufactures a variety of personal care, household and specialty products under the Arm & Hammer brand name and other well-known trademarks, is using Sterling TMS to manage its more than 150,000 annual shipments throughout North America. "Sterling TMS has enabled us to improve our shipment visibility and our overall operational efficiencies," said Chad Whyte, director, Corporate Transportation, at Church & Dwight. 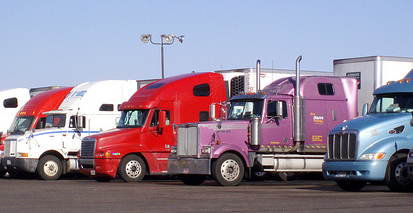 "We see a natural fit between transportation and yard management operations. Together, they can help companies achieve a deeper view of their fulfillment operations, minimize lost orders and better optimize trailer pools." Sterling Yard Management is part of the Sterling Selling and Fulfillment Suite, a unique set of applications for managing the entire process of inquiry to cash that removes the barriers to successful customer and supplier interactions by providing a single end-to-end view of multi-channel selling and fulfillment operations.